Washington Post photos Bob Fragala leads a drill for Confederate soldier re-enactors as they march to battle in Three Oaks, Mich., last month. Many re-enactors fear their hobby may be dying out. 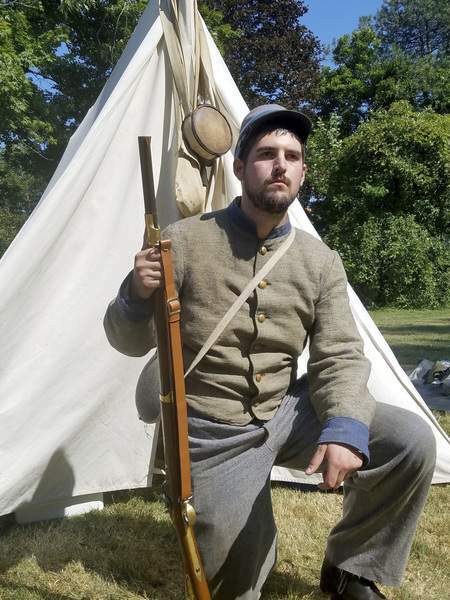 Adam Justus says he won’t continue taking part in re-enactments. THREE OAKS, Mich. – In a small town park, Confederate Gen. Robert E. Lee ends his story with his death. Then he takes questions. Adam Justus, 27, is sitting on a picnic table listening. He is dressed in Civil War garb, the only hint he is a product of the late 20th century are the tattoos on his fingers and those peeking out from the cuffs of his shirt. He made this Saturday in late August his first Civil War re-enactment because it has long been a passion of his father, who stands nearby. Old men in white beards and round bellies huddle around benches or lounge on the grass, all of them decades older than the soldiers they portray. Two hours earlier, they fought a fictitious battle between the Blue and the Gray, and two hours from now they'll do it again, as they have for decades. Justus is well aware he is among the youngest here. “They're all certain it's going to die out with them,” he says. He is not likely to pick it up, because, in light of the outcry over the Confederate statues in the South, he fears being misjudged as racist. “My generation can't talk to each other. They don't want to hear another perspective. If you label yourself a conservative or a libertarian, they don't want to talk to you,” he says. Civil War re-enactments are as old as the war itself. The first re-enactments are recorded as far back as 1861. They were a bloodless form of theater referred to as “sham battles,” which served multiple purposes: to recruit new soldiers, entertain audiences and give people back home a sense of what their loved ones were experiencing on the battlefront. Since those days, re-enactments have grown in scale, and instead of providing relief to the people whose lives would be irreparably changed by the war, the staged battles emerged as a novel form of “living history.” In every part of the country almost every weekend of the year, participants push aside historic dates and names and instead concentrate on more tangential learning: how a soldier felt charging across grass into battle, down to what he ate at the campfire before forcing sleep to come while lying on a hard earthen floor. That is what drew Samson Moore, a 17-year-old from Perrinton, Michigan, a town of just 400 people. While his friends are drawn into the virtual worlds of phones and video games, he says he wanted “a hands-on experience” with history, which he discovered a passion for in the eighth grade. The roughly $2,000 he spent on his Union outfit and gunpowder is an investment for his mind, not unlike a school trip abroad to visit historic sites. “You feel closer to the actual soldier who fought,” he says. Civil War buffs have always represented one of the more innocuous forms of weekend hobbyist, but now, even those dressed in uniform feel tension after the violence in Charlottesville, Virginia. Between programs on Saturday you can overhear re-enactors grumbling about the current headlines, all reviving bad feelings about the Civil War: the violence that has broken out surrounding the removal of Confederate statues and the co-opting of the war by neo-Nazis. “Right now people seem pretty skittish about anything having to do with the Civil War. I suppose things will calm down over time, but I don't know if 'over time' is one month from now or five years from now, because I can't tell where it's going,” says Melvin Ely, a Civil War scholar from the College of William & Mary in Williamsburg, Virginia. Some re-enactors worry that their hobby will be targeted by both sides. They resent white supremacists for attaching themselves to the war to advocate hate as well as the liberal forces for assuming they are bigots because their focus is primarily on battles and weaponry. “It's really sad. It's almost like the country's divided again,” says Michael Lechenet, 66, a re-enactor since 1972 from Dowagiac, Michigan. Lorena Morgan, 16, of South Bend, has participated in re-enactments with her parents since she was 5 but admits that “it is dying out because people are against it and want it to end.” She says it won't be worth carrying forward as an adult because she doesn't want to deal with the pushback from friends. “I'm scared at how much judgment is out there,” she says. Black re-enactors are, in fact, a proud segment of the re-enactment community as they represent the roughly 200,000 black soldiers who fought for the Union during the final two years of the war. As for those portraying Confederate soldiers and generals, they say they choose to focus on facts only and steer clear of interpretation. 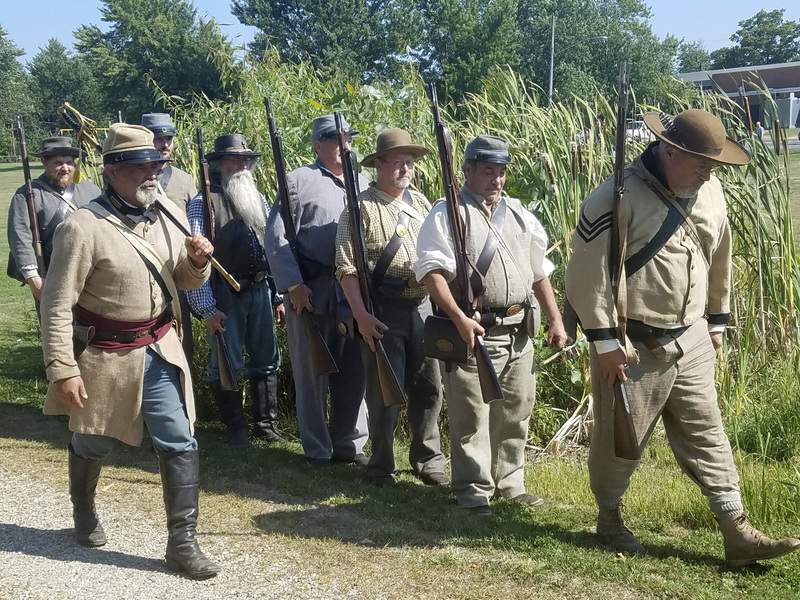 At this re-enactment, located in a quaint tourist town in Michigan's Harbor Country, nearly two hours from Chicago, the Gray soldiers double the Blue. Re-enactors say they often switch roles, but when they march across the train tracks to an open field, and a cannon blast announces the open strains of battle, it is the Union that falls dead 20 minutes later. Afterward, the captains from both sides end their trash talking, shake off their battle scars and walk to the sidelines of townspeople in folding chairs to answer questions. They make clear that the Union soldiers in their battle represented just a small detail and that likely 70,000 more would be just beyond the field waiting to attack as the Confederacy inched toward them. Bob Fragala, 53, who portrays the Confederate captain, admits that it's much more fun to play the underdog. “Any true American knows there's a true rebel in all of us,” he says. At his 57-acre horse farm in Mooresville, Michigan, he has built an entire Civil War village that he opens to the public for re-enactments. He adds that giving Confederate soldiers life on the field serves their story, which he says is usually absent in the classroom. “Anyone can say how well the Union did, but with the Southern stuff, you have to dig. These are the stories that should also be told,” he says. With the Civil War still being fought on social media, in newspaper op-eds and in the streets, some see re-enactments as a way to, if not reconcile century-old divisions, at least create fellowship between both sides. “It's a good way for descendants of the Blue and the Gray to break bread and understand the war in a historical context. They're learning American history and the war was the crucible of American history,” says Ben Jones, a former Democratic congressman from Georgia and “Dukes of Hazzard” actor who is a member of the Sons of Confederate Veterans, a group advocating to keep the monuments intact. Yet even Jones admits that the re-enactments will probably go away one day, like the monuments that are toppling this summer. “We're learning about our past when we have re-enactments and if you can do that in a benign way of camaraderie rather than in a place of sanctimony, then we can proceed. But we're in a crisis right now,” Jones says. Indeed, it is camaraderie that Wood's Lee feels as he speaks of his April 1865 surrender to Ulysses S. Grant in Appomattox, Virginia. Figuring he would be hanged, Lee says he is taken aback when Grant tells him his soldiers can keep their horses and return home.